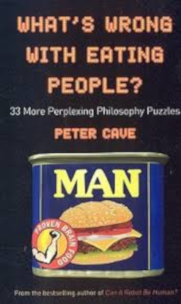 Peter Cave once again engages the reader in a romp through the best bits of philosophical thought. With the aid of tall stories, jokes, common sense and bizarre insights, Cave tackles some of life’s most important questions and introduces the puzzles that will keep you pondering throughout the night. From encounters with bears (ethical dilemmas) to talking turkeys (the problem of induction), Cave storms through philosophy’s classic conundrums with rapier wit and wisdom. Illustrated with quirky cartoons throughout, What’s Wrong With Eating People? leaves no stone unturned, covering a smorgasbord of topics including logic, ethics, art and politics. Peter Cave is a lecturer in philosophy at The Open University and City University, London. He frequently contributes to philosophy magazines and journals, from the serious to the fun, lectures around the world, and has scripted and presented philosophy programmes for the BBC. First published by Oneworld Publications in 2008.